Published on November 24, 2017 by Martyn. Be the first to comment! 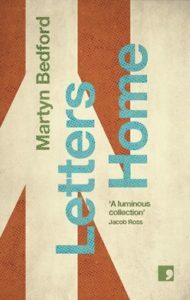 Ilkley’s Martyn Bedford has forged a career for himself as a writer of novels, but Letters Home is his first collection of short fiction and finds both the author and the short story form in fine fettle. Bedford has written literary thrillers such as Acts of Revision and Black Cat, and novels for young adults including Flip, which was shortlisted for the Costa Children’s Book Award. With Letters Home he takes perhaps a more contemplative look at distinct and diverse Northern lives. The title story is an often moving and thought-provoking tale of an asylum seeker who is living in a flat overlooking Leeds United’s Elland Road ground. Local children chant abuse at him, his door is daubed with graffiti, unspeakable things are pushed through his letter box. Still, he composes in his head letters to send home to his family, cheerful missives about how his life in Britain is safe and comforting, even as Bedford counterpoints the lines from the letters he will never send with the stark and often brutal reality of being an unwanted stranger in a strange land. In “My Soul To Keep”, Charlotte suffers from a rare condition that means she wants to sleep all the time, eventually succumbing to it and sleeping for a full year, becoming a minor celebrity in the process. Through the eyes of Kim, one of the sleep technicians tasked with monitoring the girl’s seemingly-endless sleep, Charlotte’s condition becomes almost enviable; she sleeps because it pushes the bad stuff in life away. Charlotte isn’t dead, isn’t in a coma, but is not properly alive. Instead she inhabits a strange netherworld that many people, after recent world events, would probably like to embrace. Bedford’s writing is never anything less than strikingly engaging, and his stories are portraits of lives lived always on the edge of change – in the case of the young man who finds himself living in an apartment where an obscure painter once committed suicide, quite literally so – draw you in like overheard gossip. The stories are episodes in people’s lives, which we are given access to, and rarely brought to solid conclusions. Like in the wonderful “The Beckhams Are In Betty’s”, in which a rumour that the celebrity family unit has taken over Ilkley’s flagship tearooms for a private tea provide an almost obsessive brief departure from the usual life of the protagonist. The stories are both short postcards from the edge of everyday existence, and also Martyn Bedford’s bitter-sweet love notes to life in Yorkshire, and Letters Home is a first class read.